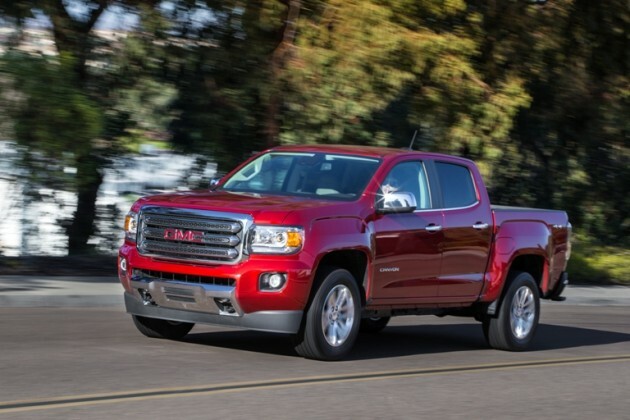 The editors at Cars.com/PickupTrucks.com recently conducted their midsize pickup challenge and found that the 2015 GMC Canyon SLT 4×4 is the undisputed best in its class in terms of capability, performance, and its use of high-end materials. The Canyon scored 1,808 points in 21 unique tests, besting its platform-mate, the 2015 Chevy Colorado Z71, which scored 1,775. The Nissan Frontier PRO-4X finished third, and the 2015 Toyota Tacoma TRD Pro ranked fourth. Tests ranged from performance, seating and ergonomics, and ride quality to tech and entertainment, value, and off-road capability. The trucks were tested not only by Cars.com’s panel of experts, but also by an unbiased pickup truck shopper. The results left the judges somewhat surprised, particular given the fact that GMC neglected to provide a truck equipped with the All-Terrain Package for testing, and yet it still held up well against the fully-decked-out competition. Overall, GMC took top scores for performance, comfort and ergonomics, tech and entertainment, ride quality, visibility, and overall value.